To recover damages, a plaintiff in a product liability case is required to show that the product which caused injury was defective, and that this defect was unreasonably dangerous. For example, while a hammer can be dangerous, it is not unreasonably dangerous and is fit to its intended purpose. Some products such as hammers or chainsaws simply cannot be made safer without losing effectiveness. For products like these, consumers are considered responsible to minimize risks associated with their use. While these products are not considered unreasonably dangerous, manufacturers and sellers are required to provide proper warnings so that consumers can more safely use these products. There are three types of product defects that may cause injury and show liability: design defects, manufacturing defects, and marketing defects. Contact a Iowa product liability lawyer representing clients in Waterloo, Iowa today to schedule your free initial consultation. Design Defects. A design defect is a flaw in a product's design that makes it hazardous. For example: an unstable piece of furniture may tip over easily and therefore be considered defectively designed. A liability claim for a design defect often requires proof of negligence. However, if the plaintiff can show that an alternative design that would have not resulted in injury was cost-effective, strict liability may be shown. This may not be required if the design was so defective that it should not have been manufactured at all. Manufacturing Defects. These occur when a product is not produced according to the design specifications. These cases are often simple to prove, because the manufacturer's own standards and designs can be used to show that the product was defective. However, this proof requires some presence or involvement in the manufacturing process. Res ipsa loquitur. This Latin term means "the thing speaks for itself". The legal doctrine means that the product defect would not exist without negligence on someone's part. Therefore, the burden of proof is not on the plaintiff, but on the defendant, who must prove they were not negligent in manufacturing the product. Strict liability. This rule does not require the plaintiff to prove negligence, but merely that the product was defective. These rules recognize that product suppliers are better prepared than consumers to argue a product liability case. Marketing Defects. Marketing defects can include improper or insufficient labeling, instructions, or warnings. They can also include a negligent or intentional misrepresentation of a product in advertising or product documentation. Manufacturing defects are also called unplanned defects, as opposed to a design or planned defect. Courts will often impose the strict liability doctrine in order to encourage stricter manufacturing procedures and investment in product safety. Strict liability also helps to lower costs involved in a product liability suit, by eliminating the factor of the manufacturer's fault. Many courts have differing rules to determine whether a product has been designed defectively. Some require a product to be unreasonably dangerous, while others simply require a product to be unsafe for its intended use. Many courts have combined elements of these two requirements. They therefore can hold a product to be defectively designed if its design leads to unreasonable danger. "Unreasonable danger" is also defined differently by various courts. Plaintiffs can also attempt to sidestep these issues and sue based on allegations of negligent design or manufacturing. Negligence asserts that the manufacturer or designer did not take sufficient and reasonable caution in creating the product. Therefore, the product is defective under a negligence claim because the designer or manufacturer did not take reasonable precautions. The legal issues involved in a product liability claim differ from state to state. If you or a loved one has been injured by a product, you may be able to recover damages based on one or more of the arguments above. You should consult an attorney with experience in product liability and negligence law. Your lawyer can analyze your case and determine whether the product was designed or manufactured defectively, and inform you of your legal rights. CALL US NOW AT (319) 234-5701 or fill out the form to the below, and we will get right back to you. We are located in downtown Waterloo, Iowa. 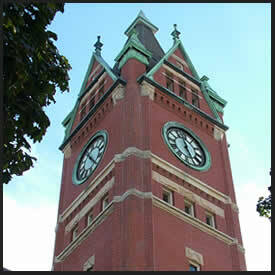 Our office is directly across from the Black Hawk County Courthouse. Waterloo, Iowa Attorney practicing in Iowa primarily in Civil Litigation, Business Organization, Estate Planning & Probate, Family Law, Insurance Defense, Motor Vehicle Accidents, Personal Injury, Premise Liability, Product Liability, Real Estate, Workers' Compensation & Wrongful Death. Lawyers at the Clark, Butler, Walsh & Hamann are dedicated to serve their clients in Iowa, including the cities of Waterloo, Cedar Falls, Fort Dodge, Ames, Cedar Rapids, Iowa City, Davenport, Dubuque, Des Moines, Adel, Marshalltown, Pella, Decorah, Eldora, Johnston, Ankeny, Muscatine, Ottumwa, Manchester, Elkader, and Burlington , and the communities that make Polk, Webster, Story, Linn, Johnson, Scott, Dubuque, Black Hawk, Dallas, Marshall, Marion, Winneshiek, Muscatine, Wapello, Delaware, Clayton, Hardin and Des Moines counties.